In the editor: enter a new line and set the caret at its beginning. On pressing Enter, PyCharm adds backslash character to avoid syntactical errors. In the editor, with selection: indent selected lines. In a lookup list, some code after the caret: select an item and substitute the code after the caret with it. Indent the current line or selected block according to the Code Style settings. Collapse the selected fragment and create a custom folding region for it to make it "foldable" / Expand the current fragment and remove the corresponding custom folding region to make the fragment "unfoldable"
Select the method to step in, if the current line contains multiple method call expressions. See Choosing a Method to Step Into. Run until the next line in this method or file, skipping the methods referenced at the current execution point and ignoring breakpoints. See Stepping Through the Program. Steps into the method called in the current execution point even if this method is to be skipped. See Stepping Through the Program. Run to the line where the caret is located. See Stepping Through the Program. Run to the line where the caret is located, ignoring breakpoints. See Stepping Through the Program. Export contents of a tool window to a text file. This feature applies to the Version Control Tool Window, Messages Tool Window, and the other tool windows that provide the export button icons toolbarDecorator export svg on the window toolbar. Move focus from the current file, class, method or reference to a data source, to a view suggested in the Select Targetpop-up menu. Refer to Navigating Between IDE Components. 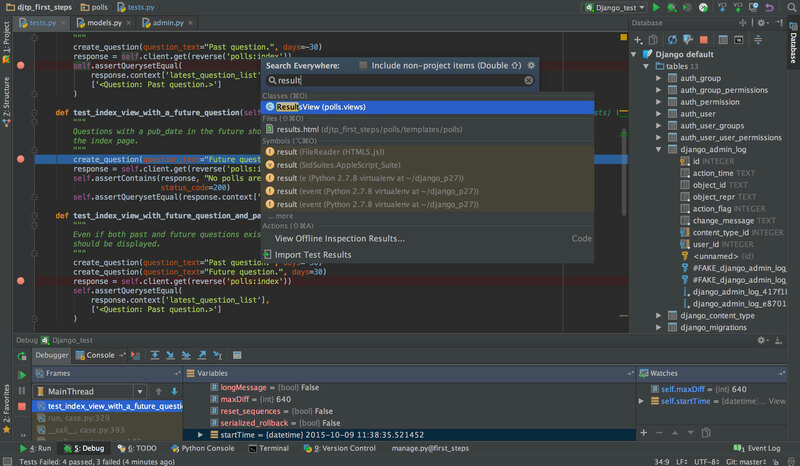 PyCharm is an integrated development environment (IDE) for the Python computer programming language. Developed by Czech firm JetBrains, PyCharm has features such as code analysis, graphical debugger, integrated unit tester. PyCharm works on Windows, macOS and Linux. What is your favorite PyCharm 2018.2 hotkey? Do you have any useful tips for program? Let other users know below.